There was a time that you could enjoy every color of a sunset, every dimple on your grandkids’ smile. Now it’s all blurring together. Maybe you want to enjoy those simple things again. Maybe you want to give the gift of those simple joys to someone you care about. Either way, you’re in the right place. Boutique Eye Orlando specializes in custom cataract surgery with advanced technology intraocular eye implants. A cataract is the clouding of the lens of the eye, which sits behind the iris and pupil. This results in diminished colors and blurry outlines in your vision. It’s extremely common, affecting over 22 million people over the age of 40, and 73 percent of the people over age 65. 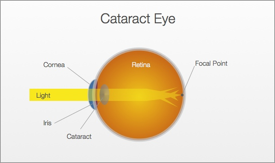 Cataracts reduces the light entering the eye, distorting everything you see. Images both near and far become clouded and faint. Your eye is a marvel of engineering. It works much like a camera lens, focusing just the right amount of light on the retina. A precise combination of water and protein allows the lens to adjust to the images you see. As we age, that clear precise combination becomes opaque, clumping together to form a cloud on the lens. Over time, the problem only gets worse. The results are often dramatic: cloudy, blurry, or hazy vision, with muddied colors and increased sensitivity to sunlight. Often people also experience glare when driving at night. At first, you may not notice the cataract. Over time, though, you’ll notice that your vision is less crisp. You’ll start to feel as if you’re constantly viewing the world through a foggy window. You’ll notice that sunsets have less color than they once did. You’ll notice that you have a bit more difficulty driving or reading. You may also notice how frequently the prescription in your eyeglasses has been changing. Cataract surgery is the most common procedure in the US. It also has the highest rate of success – but that doesn’t mean you should trust your eyes to just anyone. At Boutique Eye Orlando, we use the most advanced laser technology and years of experience to tailor each procedure to your needs. The result is an astonishing success rate that allows 90 percent of our patients to live 90 percent of their daily lives without glasses. You’ll see every line of every smile, every color of the sunset and every letter of a book.